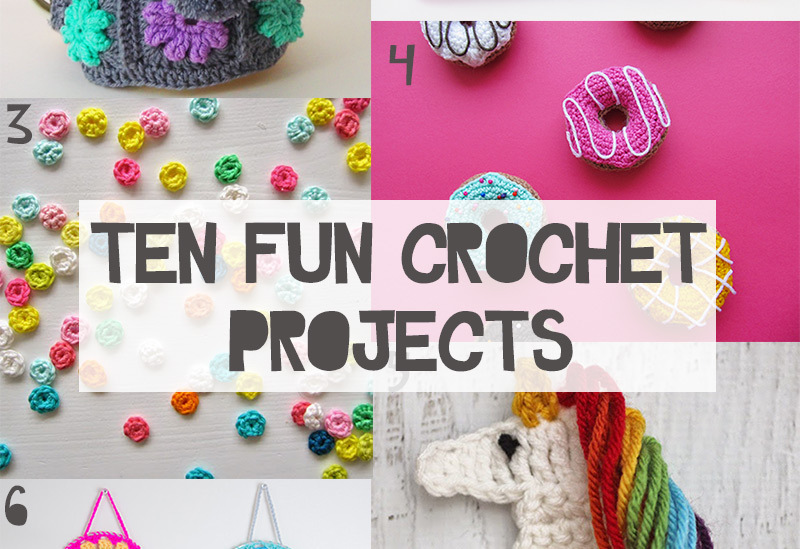 Ten Fun Crochet Projects - Great For Beginners! Since learning how to crochet earlier this year I’ve become obsessed with it. These fun crochet projects are all perfect if you like making things that don’t take too long, I really want to make a jumper at some point but know I would get bored, I’ve got two half started blankets on the go that will probably take me years to finish! I like to see results quickly which is why granny square projects are great, completing each one feels really satisfying so I find it a lot easier to finish a crochet project. 1. I love this vintage style tea cosy, I especially love the colors. I love grey against brights. You can see how it was made over on Meet Me At Mikes. 2. These crochet headbands are one of my own projects, I made them for Cherry but really want to wear them myself! 3. This crochet confetti is is cute. I would never have thought of it but it would be perfect for using as decoration in photos and I’m definitely going to be making some. You can find out how over on Color ‘N Cream. 4. These crochet doughnuts look good enough to eat and Cherry would absolutely love playing with them. Find out how to make them over on Little Things Blogged. 5. This unicorn by Repeat Crafter Me is such a great idea, you could make lots and turn them into a garland or add them to children’s clothing. So sweet. 6. These crochet dream catchers are another project of mine, Cherry quite frequently wakes up with bad dreams so I wanted to make her one and thought I would combine it with some crochet! 7. I love this crown design by Hakelfieber. 8. I love this crochet granny square dress, it’s on my list of things to make for Cherry. You can buy the pattern from Maggie’s Crochet. 9. These flowers look quite simple to make and you could so so much with them. Definitely going to be trying soon. Find out how to make them over on Atty’s. 10. And lastly this crochet bunting is another one of my crochet projects. It was really simple to make and I love the way it brightens up my kitchen.